Fresh air and fun for people enjoying the "Stepping Out" walks with Ribble Valley Council's health walks programme. People of all ages are being invited to put on their walking shoes and boots in a new series of “Stepping Out” health walks starting next month. Organised by the health and fitness team at Ribble Valley Borough Council, the walks from September 1st through to December are graded from “gentle” and “leg stretcher” health walks up to “progression” walks ranging from a moderate 90 minutes to “treks n trails” of up to three hours. “The idea of our walks is to help you improve your health,” said Tracey Balko, RVBC health and fitness officer. All the walks are free to join and led by a team of volunteers. The first Sunday health walk is from Whalley Bus Station at 1-30 pm on September 6th. Other Sunday walks are from there at 1-30 pm, or from the Platform Gallery or Mitchell Street, Clitheroe, at 2 pm. 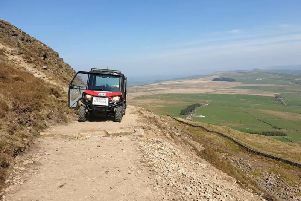 Monday off-road progression walks are at 1-30 pm. Longridge has moderate Tuesday health walks at 10am. Tuesday “stop and stare” nature walks are at 10-30 pm. Thursday progression walks are at 1-30 pm and Friday health walks are at 1-30 pm. There are also absolute beginners walks on Fridays at 10-30 am and “Tea Cup Trails with Age UK on Thursdays at 10 am. Anyone who wants to have a go can just turn up on the day at any of the various starting points. Visit www.steppingoutrvbc.co.uk or contact Barrie Williams on 01200 414484.